Biden shared with reporters his opinion that Obama had made a "mistake" by not consulting with members of Congress on his decision to appoint Leon Panetta director of the CIA! And, of course, Biden didn't stop there. OK, I admit it. 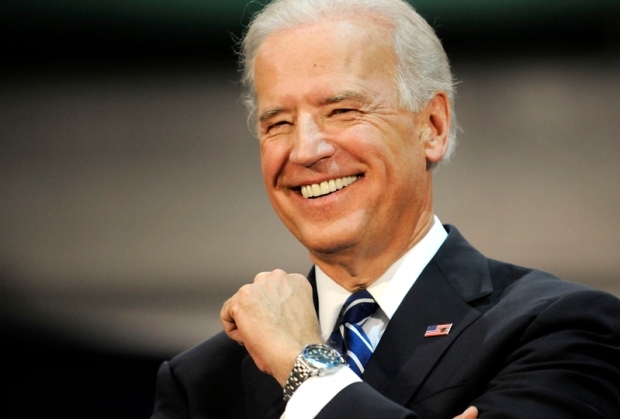 I have a real man-crush on Sen. Joe Biden. He will be a major source of pleasure for me over the next four -- or possibly, eight -- years. No, no! It's not what you think! Biden is as straight as an Amtrak tunnel. No, I love the Man from Scranton/Wilmington, not because I'm a Republican and he's a Democrat who can't quite stop his mouth from opening and declaring what he really thinks. No, I love Joe Biden because he makes my life as a journalist so much easier. Consider this: I was briefly stuck on ideas about what to write here today. Then, Boom! Like a gift from the gods, a Joe Biden quote drops in my lap. Tuesday afternoon, Biden shared with reporters his opinion that Obama had made a "mistake" by not consulting with members of Congress on his decision to appoint Leon Panetta director of the CIA! And, of course, Biden didn't stop there. Nope, even though he thought Panetta was a good choice, the best thing Biden could think to say about this man tasked with the great responsibility of intercepting foreign plots against the country is that Panetta "has been a consumer of intelligence for a long time." I've been known to "consume" beer for a long time. Doesn't mean I know how to make it -- or even analyze it! Biden also felt compelled to note, "I'm still a Senate man. I always think this way. It's always good to talk to the requisite members of Congress." He always thinks this way? And, yeah, Biden's "still a Senate man." Unlike Obama, he hasn't even resigned his Senate seat yet; he's waiting until just before Inauguration Day. So, he would rather vouch for the need for the executive branch to show due respect to the legislative rather than affirm the choices of the branch he is about to hold? He'd rather reassure his Senate colleagues than support the actions of the man responsible for making him the next vice president? Of course he would! Because -- God, bless him -- he's Joe Biden! This is the same Joe Biden that gave Republicans their only real talking points in the closing days of the presidential campaign -- pointing out that some foreign hostile power or entity would seek to "test" the next president, wondering if he (i.e. Obama) would be up to the task. And he's going to be around for at least the next four years! The tears of joy won't stop flowing down my cheeks! Robert A. George is a New York Post editorial writer. A one-time aide to House Speaker Newt Gingrich, he blogs at Ragged Thots and dabbles in stand-up comedy.